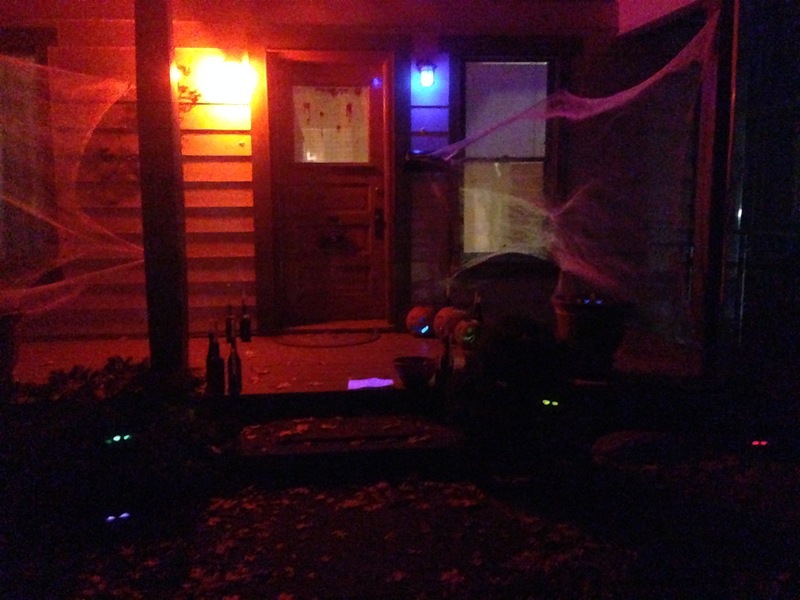 I know it’s too late for this year, but here are some decorations my roommates and I put together for our Halloween party that perhaps might inspire you in future. 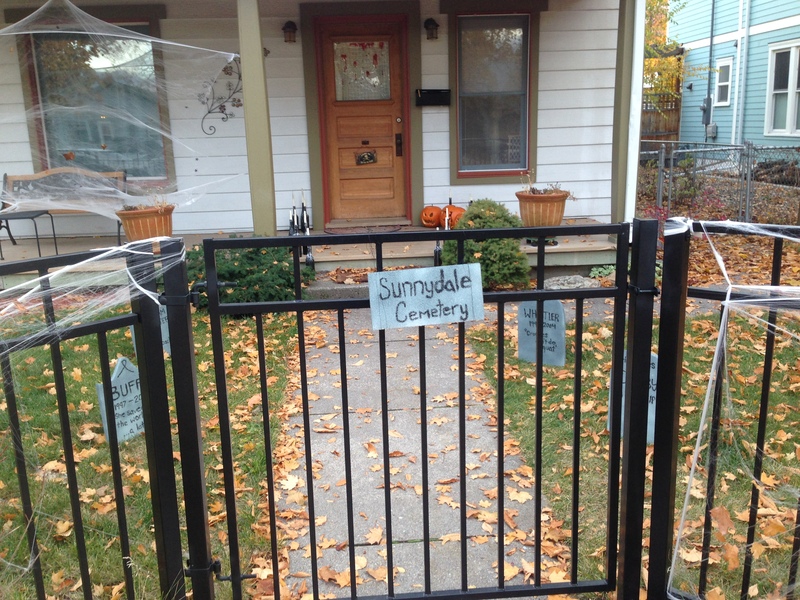 As evidenced by our trick-or-treaters, it was pretty spooky. 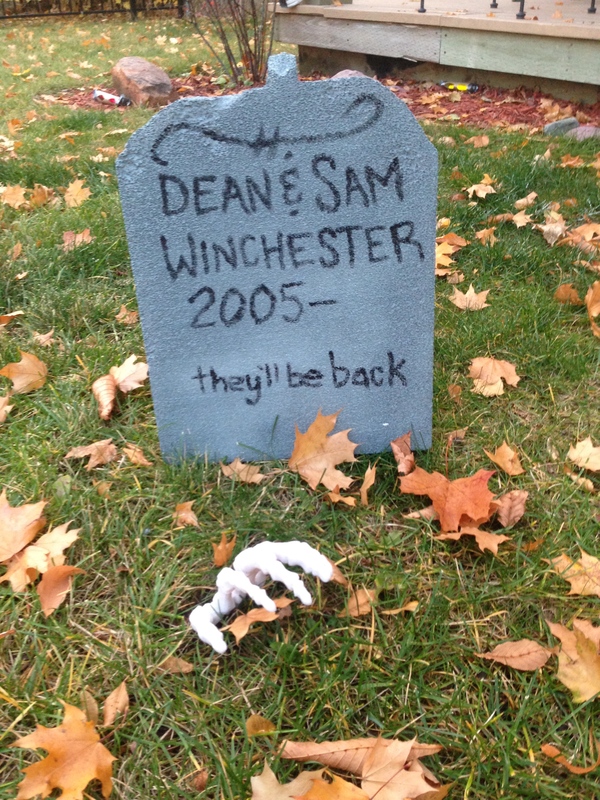 This year we decided to turn our front yard into a supernatural-themed graveyard – meaning all the dead people were from our favorite supernatural shows and movies. Things we purchased from the store and used as-is: fake, sticky, rubbery blood, from Target. 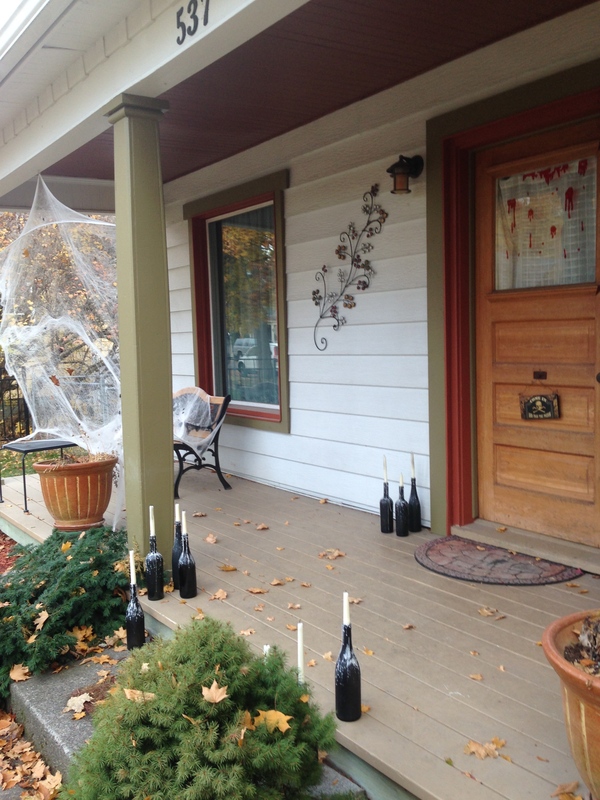 Spiderwebs, from Target and Michael’s (spiders are apparently sold separately now). 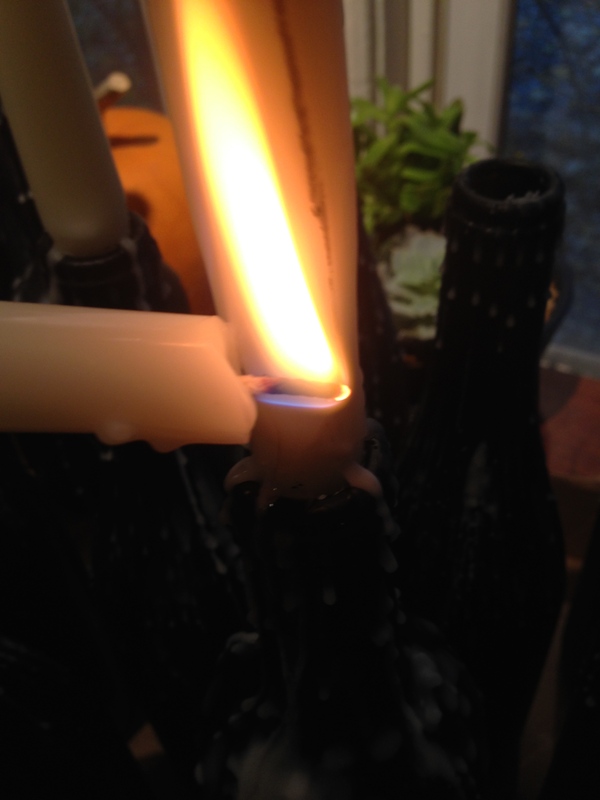 Orange and black light bulbs from Lowes. 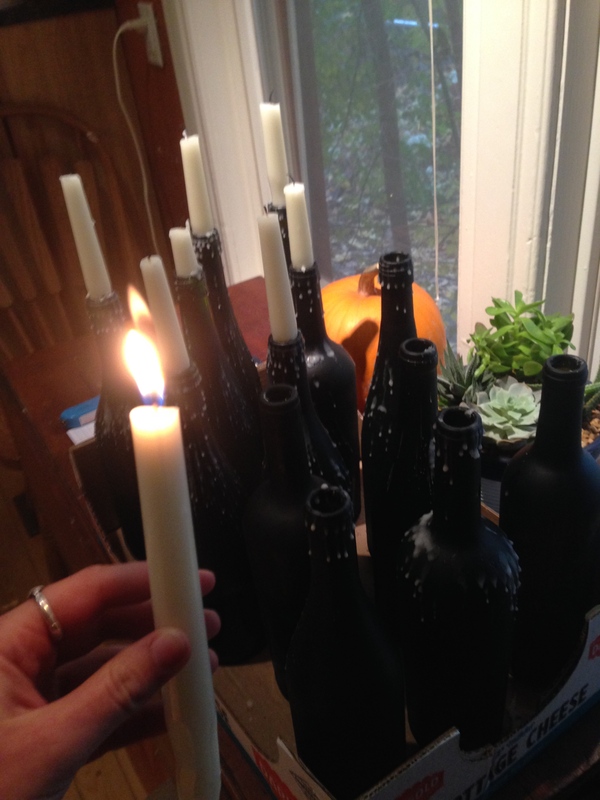 Spooky wine bottle candle holders, gravestones, and glowing eyes. 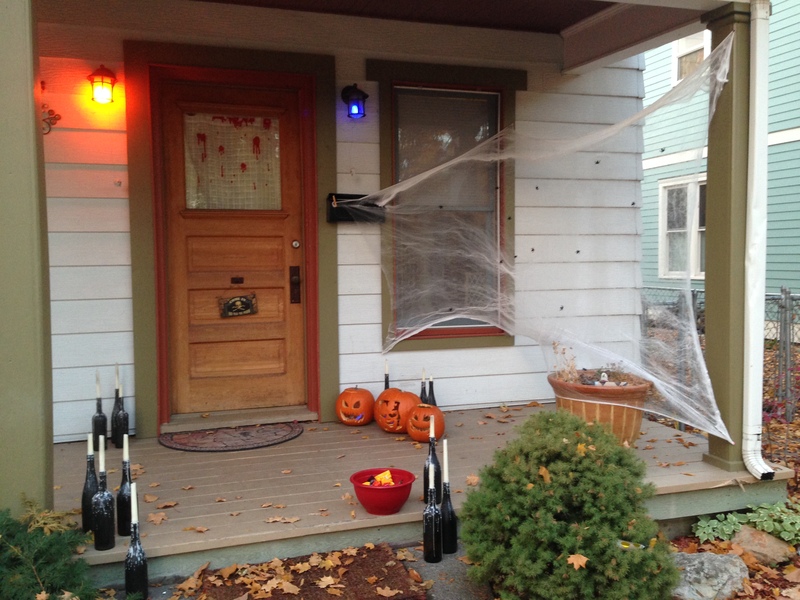 We also attempted to make chicken-wire ghosts, as seen on pinterest, but… apparently we didn’t get the right kind of chicken wire because it was rather… droopy. 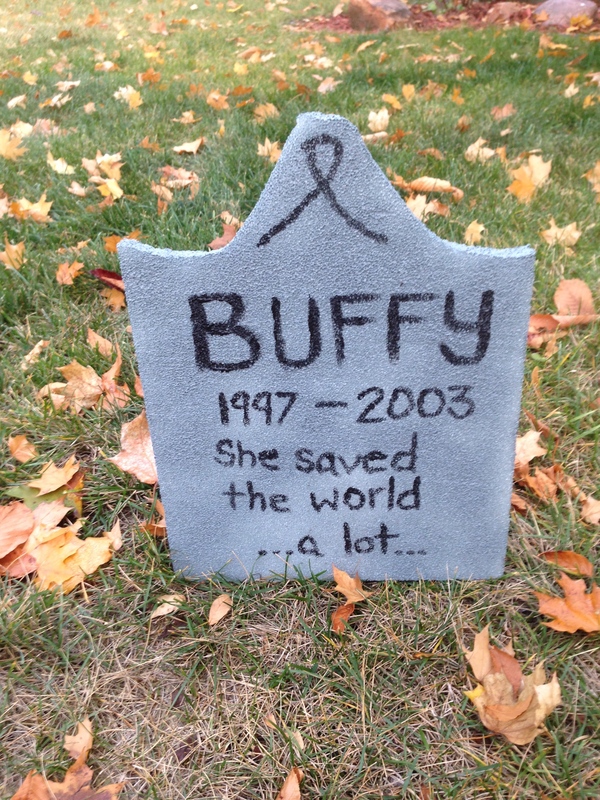 The gravestones were made from floral styrofoam, found at any crafts store (we got ours from Michael’s). These were spray-painted gray and jammed onto sticks poking out of the ground so they’d stay upright. There are various thicknesses, and we went with the 1-inch thick styrofoam because it was half the price of the 2-inch, but still thick enough to work with the sticks. 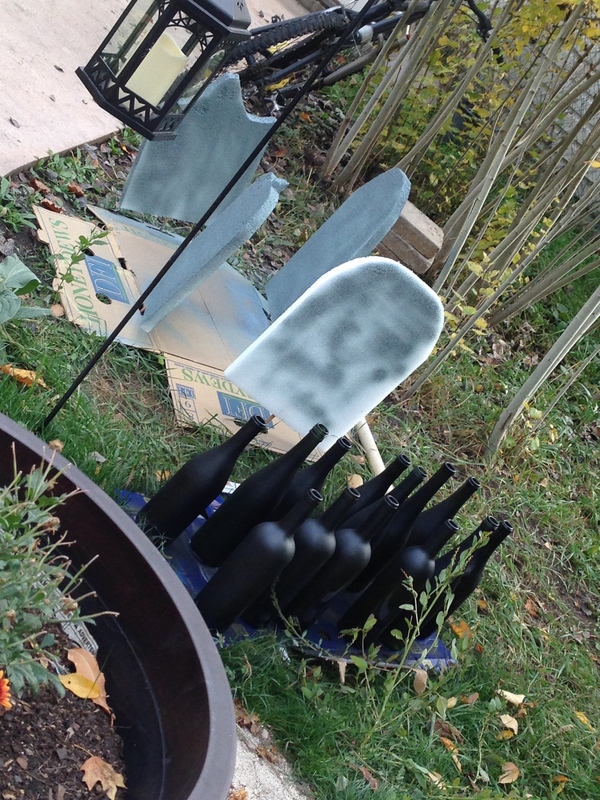 When we spray painted the gravestones (and the sign for the cemetery) we painted some wine bottles we had lying around black. 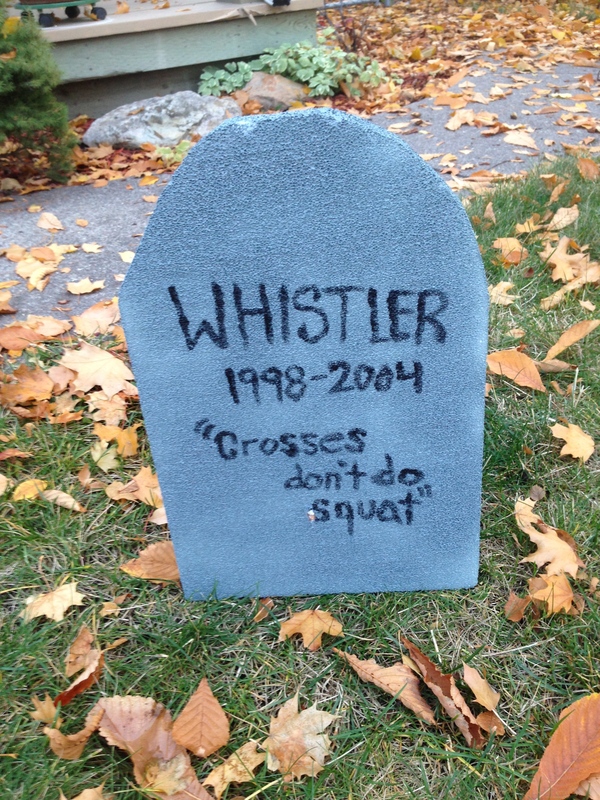 We used acrylic paint to inscribe the gravestones. A sharpie won’t work because the stryrofoam is too bubbly. 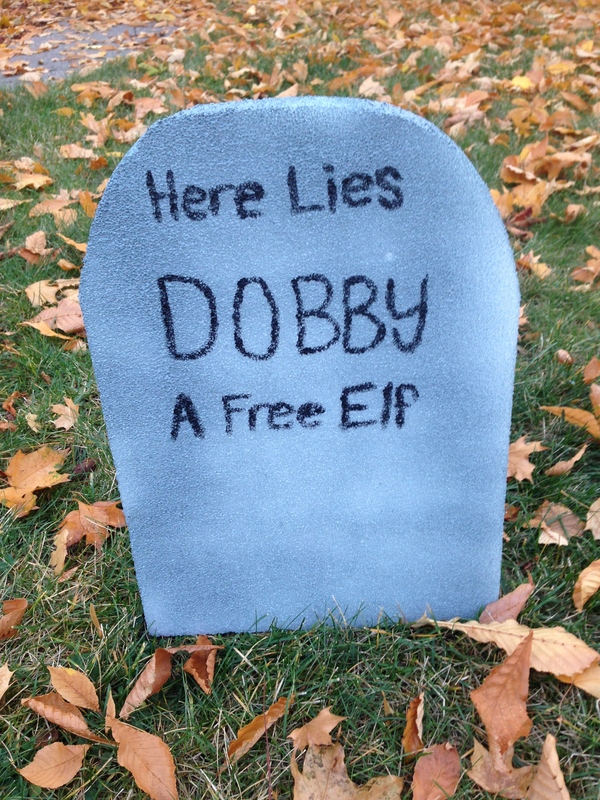 This is what I call a Pinterest win. 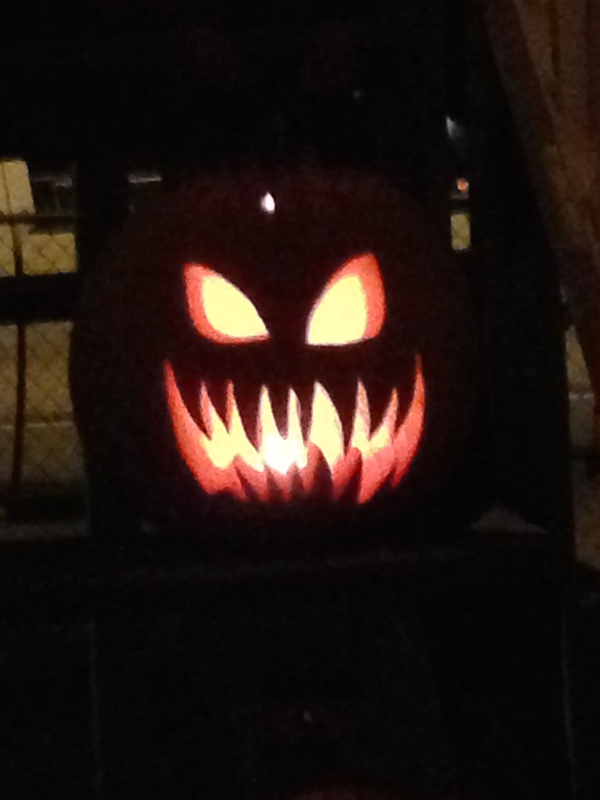 Another Pinterest win were the glowing eyes. I don’t have a before photo, but we just took paper towel and toilet paper tubes, cut eyes into them, and stuffed them with glow sticks. 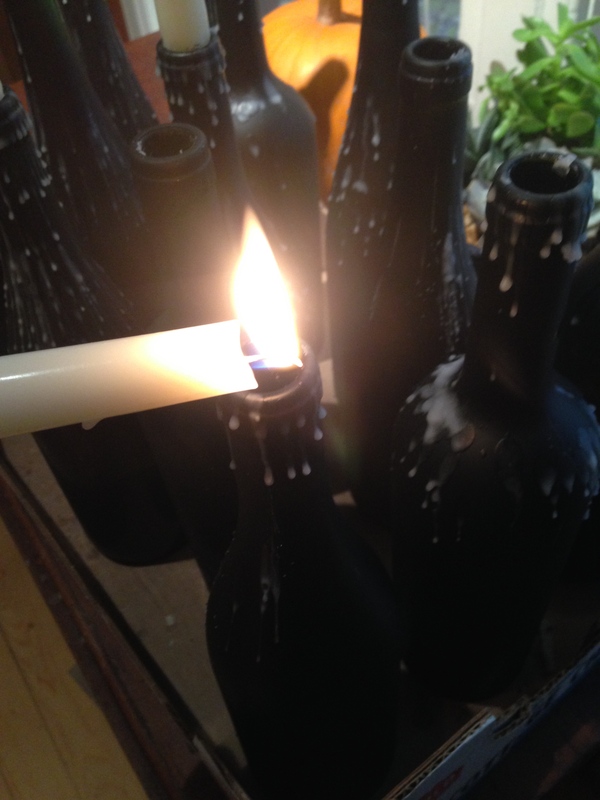 You have to wrap dark tape on the ends so they don’t glow out of them. 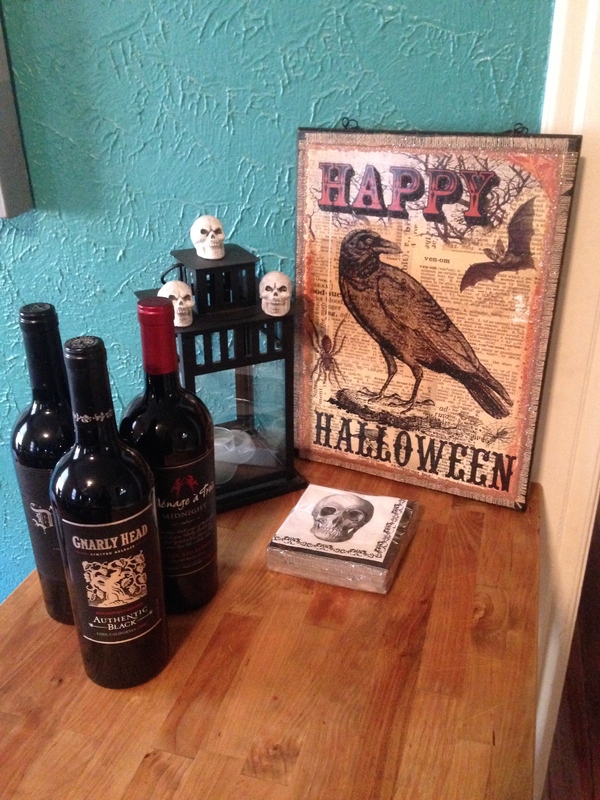 We hosted a Halloween party, and I am really proud of our wine table display, mostly put together by my roommate (I only added the wine bottles). Tiny skulls (came in a big bag) from Target, the lantern was something we had, the napkins came from the sale rack at Michaels, and the sign came from the sale rack at Joanne’s Fabrics. I love that sign so much I’ll probably hang it up in my room all year round. 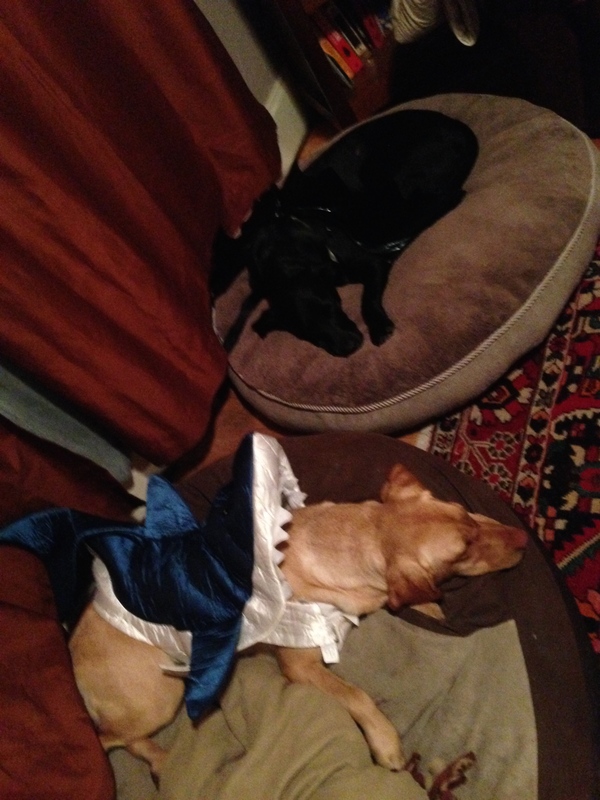 After the party, the little shark and the little Toothless dragon were very sleepy. Now if you’ll excuse me, I need to get back to watching Miss Fisher’s Murder Mysteries.